Shooting a scene at a tilt throws off a lot of the usual patterns that are often associated with pleasing or balanced visual compositions. Symmetry, for example, is almost impossible to achieve through an incline. 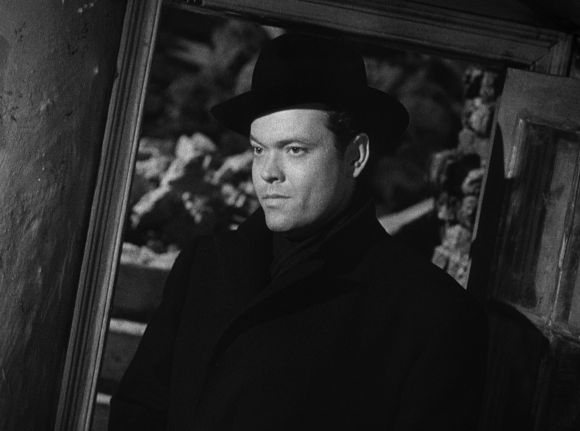 Dynamic, diagonal lines running along the composition tend to create a sense of unresolved tension, which means that watching a Dutch Angle is not the most relaxing of film experiences. Much like the epic length shot, this is not a technique that slips by unnoticed. Developed by German filmmakers in the period after the First World War, Dutch angles were seen as a means of translating the distortions and subjective visuals of expressionist paintings into film terms. Delicacy was never exactly in the cards for this device. From the school of thought that brought you this study in understatement. Of course, just because something isn’t subtle or pleasant doesn’t mean it’s not useful, and Dutch angles found a life beyond experimental German films. Classical Hollywood horror, gangster, and suspense films all made extensive use of Dutch angles, finding them to be extremely effective visual shorthand for tense or dangerous situations. If things in a film are supposed to feel “off” or somehow unbalanced for the story or the characters, tilting the camera is an effective and straightforward way of getting that point across visually. The old Batman TV show from the 60’s was famous for using Dutch angles whenever the camera was in the villain’s lair, creating an easy graphic code for its audience. Even now, conventional filmmaking wisdom writes off Dutch angles mostly as a “jarring” technique, something used to convey imbalances or to generate discomfort on a visual level. All of which is fine, but Dutch angles are great for something else almost no one ever talks about: showing who has the upper hand in an argument, or control over a situation. Think of it this way: two characters come into conflict – each one of them wants something that the other’s not willing to give up. By the time the scene ends, you’ll usually know who won from the dialogue or the actions. But if you’re in the hands of a great director, you should be able to watch the scene with the sound on mute and still have a clear sense of who has the upper hand at each point of the argument, and who walks away victorious. The great argument scenes in cinema are shot to convey this visually, and Dutch angles are a pretty sophisticated way to accomplish this. 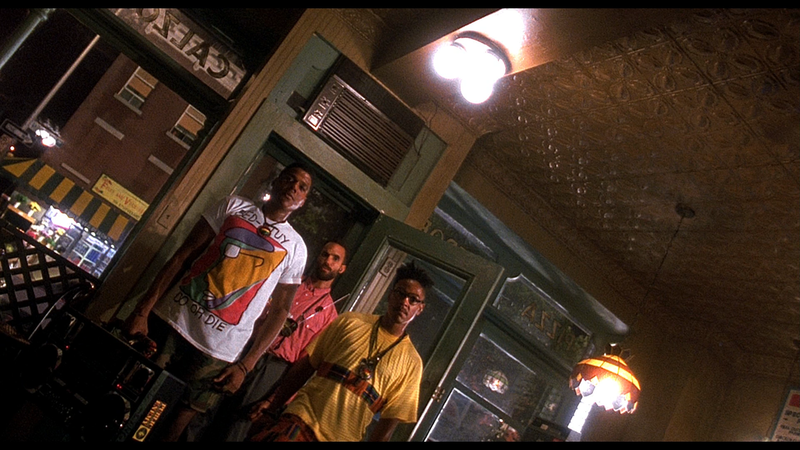 Consider, for example, Spike Lee’s 1992 film Do the Right Thing. This film is full of Dutch angles – scene for scene, there’s probably as many tilted camera shots in this film as there are in the often mocked Battlefield Earth or Thor. The difference is that Lee is actually very thoughtful about where and how he deploys his Dutch angles. Rather than using them just to signal “imbalance” or “tension,” he uses them to visually set up the terms of various confrontations in the film. Now, remember, these are character who have been coming in and out of conflict throughout the entire movie. 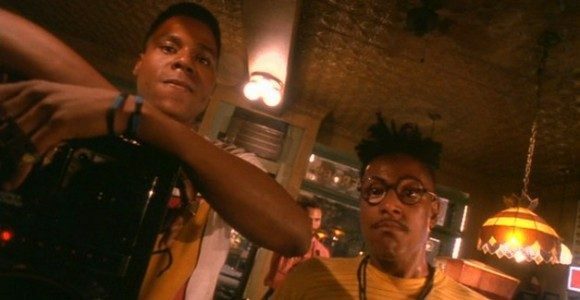 Pizzeria owner Sal (Danny Aiello) has gotten into a loud argument with Buggin’ Out (Giancarlo Esposito) about the lack of African Americans in the restaurant’s wall of fame and he’s kicked out Radio Raheem (Bill Nunn) for loudly blasting Public Enemy on his boom box. Tensions between these characters have been simmering all movie long, and they finally come to a full boil in this scene. Watch the way that Lee tilts his camera and how it maps out the dynamics of the scene. We come into the scene and Sal’s already having an argument with the group of four young adults (Martin Lawrence, Rosie Perez, Roger Guenver Smith, and Steve White) who are sitting at the table. The characters are bickering back and forth, but it’s not a particularly heated argument so the camera’s level. But when Radio Raheem and Buggin’ Out step into the restaurant? They’re announced by a severely titled camera and a close-up that pulls back, letting them step into the space. See how different the two shots feel from one another, and how radically different they make the Pizzeria look. This is the film setting up a hierarchy of confrontations. But what Spike Lee is doing is more sophisticated than just drawing attention to the gravity of the situation on hand. The scene quickly boils down to a shouting match between Sal and his two disgruntled customers. Look at the way the filmmaking presents them visually: both are shot in medium close-ups and with Dutch angles, but they’re inversions of each other. All the shots of Sal are tilted counter-clockwise and look down at him. All the coverage of Buggin’ Out and Radio Raheem is tilted clockwise and looks up at them. Again, even if we didn’t have the soundtrack or the narrative context, the way Lee’s camera shoots these people presents them as equal but opposite combatants. Unstoppable force, meet immovable object. It goes further than that, however. The film’s use of Dutch angles also lets Lee involve everyone else in that restaurant in the argument, even though they’re never in the same frame as the main combatants. By playing the camera’s orientation, the film can create a visual code to mark characters’ positions in the argument. Every time the film shows someone on Sal’s side, like his sons (played by Richard Edson and John Turturro), they’re shot with the same camera tilt that Sal gets. Likewise, whenever Mookie (played by Lee) or the kids at the table are shown, the camera tilts in the opposite direction. It even gets to act as a marker of how involved the characters are in the argument or how angry they’re getting at what’s happening. Sal’s sons are shot at a much steeper angle than the kids at the table, for example. The Dutch angles are still fulfilling their stereotypical function – the scene does feel incredibly tense and unstable. But they’re also mapping out our understanding of the scene’s conflict. It makes clear where everyone stands while still being able to capture the intensity of the performances through close-up and getting energy from the constant cutting among all the different characters in the scene. … but only for a moment. Before Sal’s even done smashing the radio the film starts showing him in Dutch angles again, only now there’s a major difference. Whereas before Sal was shot with a counterclockwise tilt and from above, now the camera’s looking up at him with a clockwise tilt. 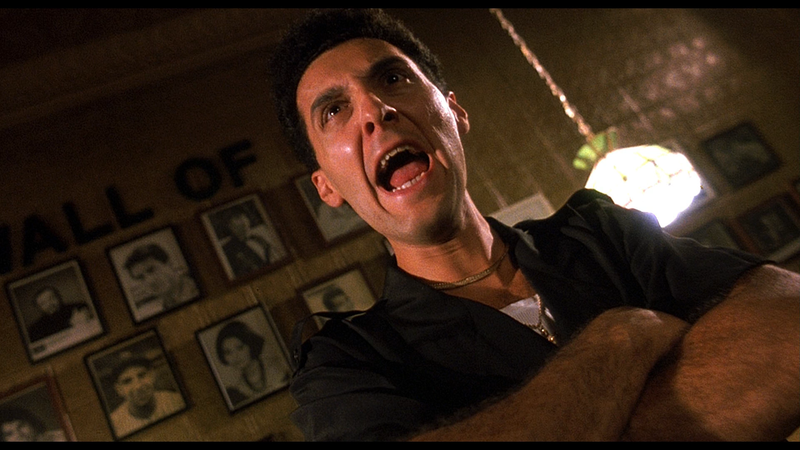 He’s now being shot the way that Buggin’s Out and Radio Raheem were for the first part of the scene. In a narrative sense, the character has crossed a line, and the film reinforces this point visually. In trying to level out the situation, he’s gone too far, and now he’s invading their visual register. It doesn’t take long after that for violence to break out. Do the Right Thing almost plays like a manual on how Dutch angles can be used to demarcate personal relationships. Lee uses them to show almost every kind of relationship, from two people being more similar than they might at first appear to one half of an argument being hopelessly outgunned. And, fortunately for us, Lee isn’t the only one that is using this technique to demarcate personal conflicts between characters. Christopher Nolan memorably employs a tilting, rotating camera in the final confrontation between the Joker and Batman in The Dark Knight, using the unusual orientation to suggest the Joker’s continued influence and authority over the scene in spite of his hanging upside down. In perhaps one of the most committed illustrations of the effect, John McTiernan spends the first half of Die Hard shooting John McClane with a lot of Dutch angles and Hans Gruber almost entirely with a level camera, and then gradually reverses that as one character loses control of the situation and the other gains it. One of the beautiful things about filmmaking and cinematography is how they are able to affect us subconsciously, pushing us towards reactions or understandings without us even being aware of what’s happening. Dutch angles are an ostentatious device, but even they can work towards the creation of very subtle and elaborate patterns. If you want to break the invisibility that often surrounds the process of storytelling in film, the next time you run into a Dutch angle think about what it’s actually doing. How is it working beyond the shot itself, in the context of the scene around it? Is this just here to provide a quick jolt to the audience, or to establish a mood of tension or dread? Or is the film trying to tell you something about who is in control of the scene, who is losing it, or who just won a major confrontation?